Ottawa was unseasonably warm but smothered in thick fog as we flew in on Thursday afternoon and headed off to the Shaw Centre, spiffy venue for the much-anticipated debut of Canada’s Great Kitchen Party in the nation’s capital. It promised to be a stellar event, with sports guru extraordinaire Scott Russell stepping up as MC, and 19 elite athletes in attendance, including Curt Harnett, Camille Bérubé, Adam Van Koeverden and Todd Nicholson. Sport is a major pillar of our Kitchen Parties. So is music. Tom Cochrane held the audience spellbound when he opened with his song Big League, with a new third verse as a tribute to the Humboldt Broncos – just one of many unforgettable moments from him, his fellow headliner, Barney Bentall, and guitarist Bill Bell, backed by Tally Ferraro on bass and Gianni Ferraro on drums. By the end of the evening, the crowd was on its feet, dancing in front of the stage to Life is a Highway and Something to Live For. It was a triumphant night on every level with the energetic vibe carrying over into eager bidding when our unique and irresistible trips came up for auction. Without a doubt, the merry mood was also inspired by the splendid food created by our ten competing chefs. Ottawa’s culinary scene is excitingly eclectic and sophisticated these days and choosing only ten is always a challenge for our Senior Judge for Ottawa-Gatineau, author, critic and fount of gastronomical wisdom, Anne DesBrisay. Joining us on the judging panel was a very high-powered posse: industry leader and owner of Thyme and Again Creative Catering, Sheila Whyte; Chairman of the Canadian Culinary Federation and executive chef of the House of Commons, Judson Simpson; the only chef in history to be named Canadian Culinary Champion twice, Chef Marc Lepine of Atelier; publisher, food writer and culinary historian, Dr. Janet Boileau; and last year’s gold-medal-winner, Briana Kim, chef-owner of Café My House. We awarded the bronze medal to Jason Sawision of Stofa Restaurant. 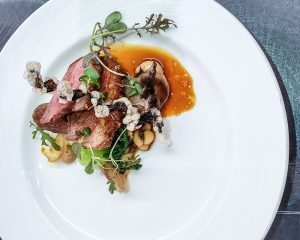 At the heart of his dish were two thick slices of aged Hudson Valley duck breast, cooked sous-vide, pan-seared then glazed with miso honey and finished with a dusting of pink peppercorn, dried orange zest and coriander seeds. He also turned duck leg meat into a miniature sausage pungently flavoured with lemongrass, kaffir lime, galangal, soy and red curry paste and set it beside a mound of black-eyed peas tossed in Thai Nam Prik sauce. Other treasures included a single baby bok choy, petals of pearl onion pickled in black Chinese vinegar, and a big, juicy hen of the woods mushroom. Three other big flavours added further variety – a sweet-sour preserved orange marmalade, a salty fermented black bean mayo and some tangy green perilla and mustard greens. 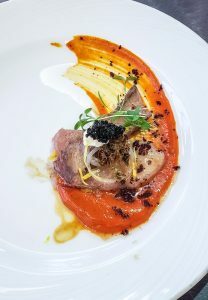 A crispy nori and tapioca spiral became a jaunty garnish and Chef finished the dish by pouring a little dashi duck jus onto the meat, thick as a demiglace and packed with umami. The wine he chose to accompany the dish was the Domaine Queylus 2016 Cabernet Franc from Niagara’s Lincoln Lakeshore VQA, its spicy notes echoing some of the Asian flavours in the dish. The judges agreed it was an excellent choice. Daniela Manrique of The Soca Kitchen won the silver medal with a dish she called “Mar + Tierra.” The Mar was a thick slice of spectacularly rich, raw hamachi belly; laid across it, the Tierra turned out to be a thinner cut of roasted Secreto Ibérico ham shoulder dusted with porcini powder. Both these flavour-bomb proteins were set on a soft purée of orange-coloured rocoto chilies that brought a pleasing heat to the party. Other chilies – aji amarillo, to be precise – perfumed a dab of stiff crema with the texture of ricotta, topped with a delectable moment of Acadian caviar. And here was a spoonful of lightweight vinaigrette sweetened with Pedro Ximenes and black garlic. And there a tiny ring or two of compressed pearl onions, pickled with kaffir lime. Crispy capers, a hint of lemon zest and some chopped dehydrated Kalamata olives upped the pleasure ante even further. The dish called for a wine that was light on its feet but at the same time rather profound. Chef found those precise qualities in the fabulous Thirty Bench 2016 Small Lot Chardonnay from Niagara’s Beamsville Bench VQA. 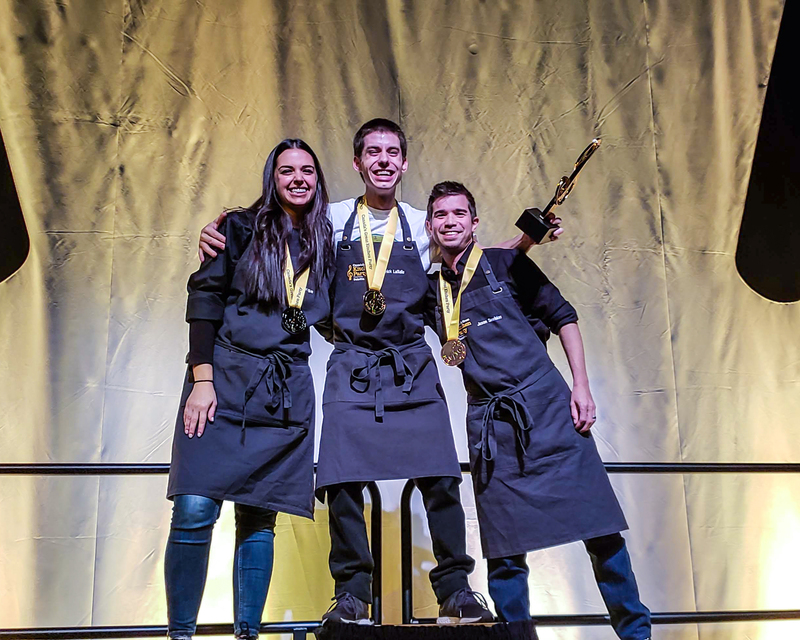 We awarded the gold medal to the chef who had won silver last year – Yannick LaSalle of Restaurant Les Fougères in Chelsea, Quebec. He explained that the inspiration for this year’s creation came from the red currants growing in the restaurant’s garden. Two or three of these tart crimson jewels appeared whole on the plate, part of a sauce made with red currant vinegar and sweet, earthy beet syrup. Chef drizzled a spoonful around the dish as he set it down and it pooled and beaded in the sheen of hazelnut oil on the plate. The beets returned as a vegetable, having been lightly poached with lemon verbena then grated and pressed with tangerine marigold, also from the garden at Les Fougères. We are all accustomed to treating protein as the heart of a dish but in this case it was so well balanced and integrated into the whole that it did not dominate. Tucked away, almost, beneath the other ingredients were slices of cured duck breast, each with a new moon of soft white fat at its rim. 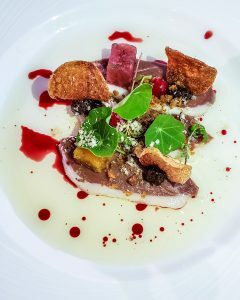 Chopped crispy duck skin added textural variety, as did crisp loonie-sized potato chips seasoned with black garlic salt. More black garlic became a purée, spiked with grainy mustard – the sort of condiment they have on charcuterie boards in heaven. Quebec black walnuts provided the coup de grace, shaved over nasturtium and marigold leaves, echoing the nuttiness of the hazelnut oil. The dish had exemplary intellectual integrity – very much to do with a certain place and a certain time of the year. It was also absolutely delicious. And the wine match was brilliant, its acidity alluding to the red currants, its spiciness perfect with the walnuts – Meldville Vineyards 2015 Cabernet Franc from Niagara’s Lincoln Lakeshore VQA. 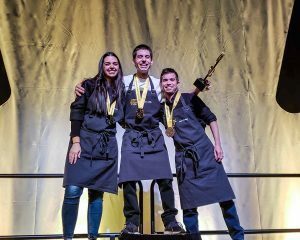 Huge kudos to Chef LaSalle who will be coming to Kelowna in February – and to the peerless team behind the Ottawa-Gatineau Kitchen Party who made this one of the most memorable events we have ever staged in the city. Next week, we’re off to Edmonton, Halifax and St. John’s… I can’t wait!